There are two types of iron: heme and non-heme. Heme iron comes from animals (eggs, red meat, seafood and poultry) and is absorbed at a much higher rate than non-heme iron which comes from plants (leafy greens, beans, and fortified grains). To increase iron absorption never take it with regular or decaf coffee or tea! Try pairing iron with vitamin C (orange juice, bell peppers, strawberries) to increase absorption. Iron deficiency anemia is very common during pregnancy. It’s important to have good iron stores before pregnancy to reduce the risk of developing it. 38 weeks and counting! Still going strong and feeling well. In terms of iron for my pregnancy, my prenatal vitamins provide 30mg. So I’m covered in my pill. However, I think it’s important to eat a varied diet and I have eaten more red meat during pregnancy than before. Part of that is because I’m eating less fish when out at restaurants! I also consume leafy greens and beans on a regular basis. Do you struggle to find an afternoon snack that not only keeps you full but tastes good? And sometimes you find yourself mindlessly adding money to the vending machine to get your sweet or salty fix? Well I’ve come up with a great alternative for those who yearn for afternoon pretzels as a snack. 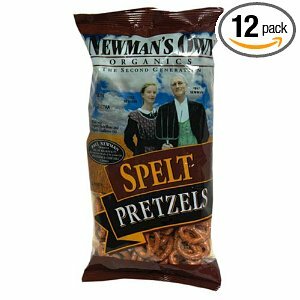 Newman’s Own does it again with their Spelt Pretzels. Most pretzels are made of refined flour that give you a burst of energy, but leave you sluggish soon after. These spelt pretzels are made with spelt flour (a type wheat) and a few other ingredients (sunflower oil, salt, yeast and sodium bicarbonate). The short and healthy ingredient list makes it a go to snack choice. The nutritional information for 20 mini pretzels are: 120 calories, 1 gram fat (0 g sat fat), 240 mg sodium, 23 grams carbohydrate, 4 grams fiber, and 4 grams of protein. Nutrition Tidbit: Pretzels and other high-carb snacks can be addicting, portion out one serving rather than eating straight from the bag! Have you tried these pretzels? To set the record straight, pasta is not fattening, in fact it contains very little fat. The issue is that if you overeat carbs (ie you give your body more than it needs) then your body will turn the extra carbohydrates into fat for storage. The main issues I see with pasta are that it’s usually eaten as a refined grain (regular semolina pasta) and that the portion is too large. However, pasta can be enjoyed in a healthy way when you keep an eye on your portion and if you choose whole grains. 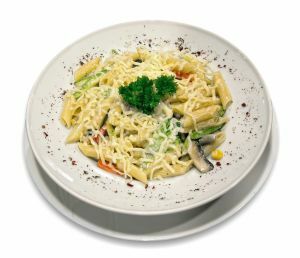 White pasta is fine sometimes, but try to choose whole grain the majority of the time. The fiber in the whole wheat pasta will help keep you more full, stabilize your blood sugar levels, and provide more vitamins and minerals. Having trouble switching to whole grain? Here are a couple brands I recommend. Barilla Plus – you can find this kind at your average supermarket. While it isn’t 100% whole wheat, it’s a good compromise especially for those who love white pasta. Whole Foods 365 Whole Wheat Pasta – this pasta gets rave reviews time after time. And it’s less expensive than the other brands sold at Whole Foods! Nutrition Tidbit: 1 cup of cooked pasta (white or whole wheat) contains approximately 200 calories. It does vary based on shape. If you want to be very accurate then weigh out the pasta before cooking. 2 oz of dry (uncooked) pasta is 1 serving. Do you like Whole Wheat Pasta, or have you had trouble switching? Protein is involved with the development of new cells, enzymes, and hormones. Protein helps your baby develop properly. Including: hair, fingernails, skin, and organs! Protein is crucial to keeping a proper fluid balance in your body. So how much does a pregnant woman need? 1st trimester your needs are the same as someone who is not pregnant: 0.36 grams/pound of body weight (pre-pregnancy weight). A woman who weighs 135 pounds requires 49 grams of protein. 2nd & 3rd trimester your needs increase to: 0.5 grams/pound of pre-pregnancy body weight plus 25 grams. The same 135 pound woman now requires 93 grams of protein. If you are a vegetarian or vegan, make sure that you are consuming complementary proteins. To learn more about complete proteins and incomplete proteins read these posts. A lot of the time I have cottage cheese or yogurt with my lunch for protein. I also consume the breakfast proteins as my snacks. Do you find it hard to reach your protein needs? Additionally, my fellow dietetics/nutrition classmate was told by her doctor that she was vitamin D deficient. A lifelong resident of the Northeast, she has very limited exposure to sunlight and therefore likely has little D synthesis going on in her body (more on that later). And finally, a good friend of mine gave birth to her first child, an adorable little girl named Sierra. Since breastmilk does not contain adequate D, Sierra and other exclusively breastfed babies must be given supplements to meet nutritional requirements. However, Sierra doesn’t like their taste and spits them out. Her mother, a nurse practitioner who is well informed about nutrition, is vexed. “Can she get enough vitamin D sitting beside a closed window on a sunny day?” she asked me recently. What is vitamin D, anyway, and why is it so important? It’s an essential vitamin for human life that acts as a hormone, regulating calcium and phosphate in the body to ensure healthy bones, as well as influencing neuromuscular function and reducing inflammation. Vitamin D is found naturally in relatively few foods, but often products (milk, margarine) have vitamin D added to them in a process called “fortification.” The body synthesizes D when exposed to the UV rays in direct sunlight. (Sorry, Kimmie, the necessary rays can’t penetrate glass – Sierra has to take those yucky supplements.) Vitamin D deficiency can lead to diseases such as rickets (soft bones and skeletal deformity) and osteomalacia (weak muscles and bones). So… if it’s in some foods and even in the sun, for goodness sake, then what is causing a potentially widespread vitamin D deficiency? Location. In the northern half of the United States, it is nearly impossible to get enough sunlight to synthesize adequate D in late fall/winter months. Only Los Angeles (or on the east coast, Columbia, SC) and their southern neighbors receive enough sunlight for adequate year-round D synthesis. Indoor mania. Many Americans spend the vast majority of their waking hours indoors, hidden like vampires from the sun. How many people do you know who wake up in the morning, get in their car, drive to work, step into the office for the day, drive home, and then stay inside all evening? That makes for barely a moment outdoors, let alone at the peak 10 am – 3 pm sunlight hours. Children do not fare much better: a new study from the Kaiser Family Foundation shows that youth ages 8-18 spend 7.5 hours each day watching TV, playing on the computer or using a smart phone – and presumably little of that occurs outdoors. Sunscreen. Given the correlation between UV rays and skin cancer, it is not uncommon for Americans to use sunscreen at all times when in direct sunlight. This severely inhibits D synthesis. The National Institute of Health recommends 5-30 minutes of sun exposure without sunscreen between 10 am and 3 pm at least twice a week to the face, arms, legs or back to lead to sufficient vitamin D synthesis. Diet. Vitamin D is found naturally in many fish (salmon, mackerel, tuna, sardines, catfish), egg yolks, and beef liver; foods that are often D fortified include milk, orange juice, yogurt, margarine and cereals. Skin tone. Darker skinned individuals have more melanin (pigment), reducing the skin’s ability to produce vitamin D from sunlight exposure. African American women are 10 times more likely than Caucasian women to be D deficient. Obesity. People with a BMI greater than 30 often have low D levels due to excessive body fat, which stores vitamin D and keeps it from circulation in the blood. Although you can’t change your skin tone, you can control certain lifestyle factors to attain adequate vitamin D intake: eat D-rich foods (whether naturally or via fortification), get enough direct sunlight, and maintain a healthy body weight. And if it comes down to it, move to San Diego or Florida. All in the name of health, right? What have you heard about Vitamin D in the news or from friends? Do you know if you’re deficient? I think one question that so many clients of mine ask me is: “Can I eat red meat?” Red meat has gotten such a bad rap because it’s high in fat and cholesterol so when your doctor tells you that you need to lower your cholesterol you automatically eliminate red meat. Well there is some validity to that, however, it’s not necessary to eliminate all red meat from your diet. The key is to choose LEAN red meat. 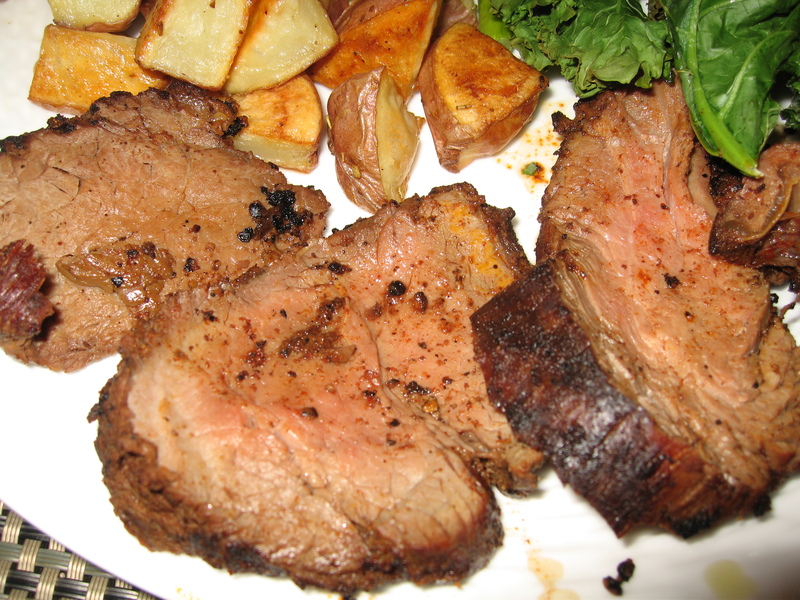 My favorite beef choices are: beef tenderloin, filet mignon or sirloin. When choosing ground beef, make sure to choose one that is at least 90% lean. 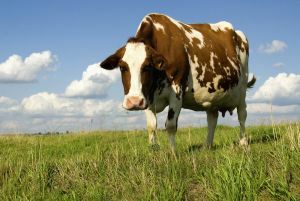 For more about ground beef make sure to read this post I wrote a while back. 3 oz of broiled filet mignon (all fat removed) has: 175 calories, 8 grams fat, 3 grams saturated fat and 25 grams of protein. Yes it does contain 78 mg cholesterol (26% DV), however, saturated fat plays a greater role in blood cholesterol levels than cholesterol itself. Red meat contains heme-iron which is absorbed at a greater rate than non-heme iron (found in vegetable sources). This may be important for people who are anemic, women, and in particular pregnant women who’s needs are higher. Keep in mind most restaurants serve portions that are much greater than 3 oz. In fact 6 oz would be considered a small serving (350 calories). At a steak house you may be getting 12 oz which will be over 700 calories, because they also add butter to it! When ordering steak out, request it without added butter and get the sauce on the side. Also considering getting a soup or salad to start and sharing the meat with someone or taking half home. Do you eat red meat? What’s your favorite type? During pregnancy, there are many important nutritional needs, but one I like to focus on is calcium. 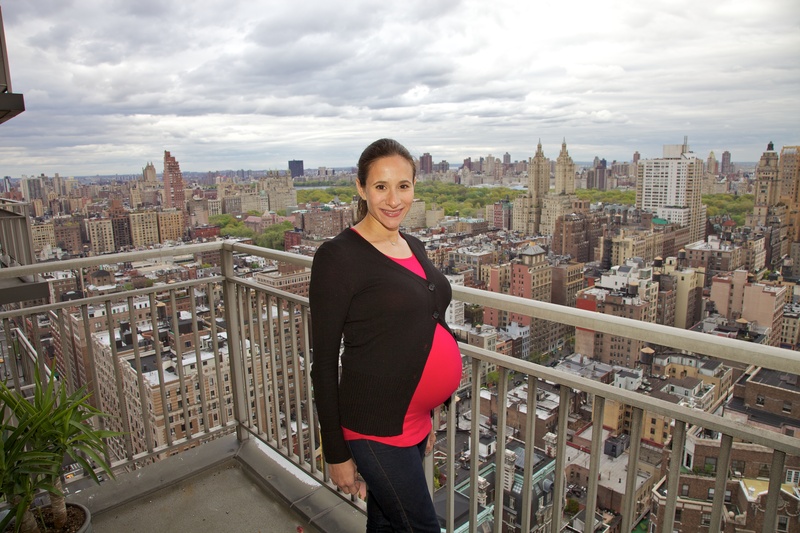 Why is calcium so important during pregnancy? Your baby needs calcium to grow bones and teeth! Calcium helps other parts of the baby develop such as his/her heart, nerves and muscles. Calcium is also important for the baby to develop normal heart rhythms and the ability to form blood clots. If you don’t consume enough, the baby will take it from your own bones! The recommendation is the same as pre-pregnancy, if you are over 18 years of age you need 1,000 mg/day. If you are under 18 years of age you need 1,300 mg/day. Try tallying up how much you consume on a daily basis. Read the label on your prenatal supplement, there’s usually a couple hundred milligrams in there. Add up all the dairy (but read labels b/c they vary quite a bit! ), fortified drinks (orange, soy milk, etc), canned salmon with bones and sardines, protein bars and other fortified foods (ie luna bars contain 350 mg calcium). Leafy greens and almonds contain calcium too. If you fall short of 1,000 mg, consider taking a supplement or examine more ways to get calcium through food. Remember vitamin D helps aid in the absorption, so look for a supplement that is USP certified and contains vitamin D.
Your body can only absorb 500 mg at a time, so don’t take a supplement with a dairy meal (for example breakfast if you’re eating milk or yogurt). Try taking your calcium supplement separate from your prenatal vitamin b/c some of the minerals may fight for absorption. How do I get my calcium? My prenatal vitamins have 400 mg of calcium in them, however, the calcium pills are separate. I try to take the vitamins in the morning and then the calcium with lunch or dinner. Everyday I aim to have a greek yogurt (200 mg), 1 glass of skim or soy milk (~300 mg), and 1 oz low fat cheese (200 mg). Some days it may be slightly different. I occasionally have luna bars for a snack (which may replace one of my dairy servings) and other days I may have a yogurt and 2 servings of cheese. Then there are some days I just fall short – usually on the weekends since my meals are not as structured. I do consume leafy greens and almonds almost daily so I probably get at least 100 mg more each day through those foods, however, I would rather go over 1,000 mg than be under, so I just use those as an added benefit and don’t count them. 1 ounce of almonds has 75 mg of calcium and 1/2 cup cooked spinach has 136 mg (but the oxalates to decrease absorption rates). What I make sure to do is at the end of the day I tally what I have consumed and if it’s low I will take an extra calcium supplement to make sure I make my quota. The last thing I want is my baby taking calcium from my bones! How do you get enough calcium?